The Owner Portal allows a property manager to provide their owners with an online account, accessible via desktop or mobile, to view real time property performance. 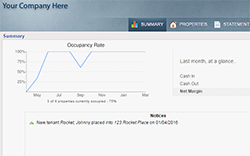 Owners can see simplified data of overall property performance, view files and attachments that you share with them, and see more detailed ledgers for their properties. Each owner is given a unique login to view a personalized online account that only displays information relevant to their properties. Read about the benefits of an owner portal.